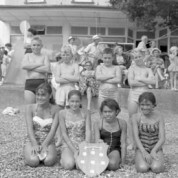 If anyone can name swimmers or spectators, Russell Museum would love to hear from you. Call us on 4037701 or visit. We are open 10am to 4pm, seven days.